All of the new cards have a digital photograph, a holographic state seal and an additional ghost image of the licensee on he bottom right-hand side for security. How to renew your license. The intermediate license is issued to residents 16-18 years of age. Possession allows the resident to operate a non-commercial vehicle, however these drivers are prohibited from operating a motor vehicle with more than one unrelated passenger unless a driver over the age of 21 is also present and prohibited from operating a motor vehicle from 11 p.m. to 4 a.m. unless accompanied by a driver over the age of 21, driving for emergency purposes or driving from a school activity, church function or job. 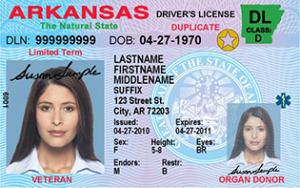 These licenses look the same as an under 21 license, except the Arkansas silhouette in the top right corner is yellow, and there is an additional yellow highlight with the date the person turns 18 under the photograph. The learner’s license is issued to residents aged 14-16 and allows the resident to operate a motor vehicle as long as a licensed driver age 21 or over is present. It looks much like the intermediate license, except the Arkansas silhouette in the top right corner is white. How to get your permit. Commercial licenses are issued to drivers of commercial vehicles in class A, B and C. They look like a class D license except the Arkansas silhouette is blue, and the letters CDL and the class appear in the silhouette. Non-Driver ID cards are available that looks like a normal class D license or an under 21 license. These ID cards are used for ID purposes for residents who do not have a driver’s license. They have a red Arkansas silhouette with the words “ID Only” written in it. You may choose the new Arkansas Voluntary Enhanced Security DL or ID. This new card will be compliant with the Federal “REAL ID Act of 2005,” and will provide enhanced security from fraud and identity theft. The new card will cost the same as a regular DL or ID card. The new card will also contain a gold star shown on the upper right corner. 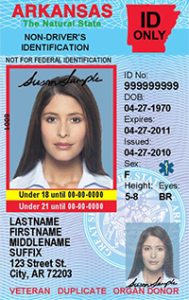 You may choose to renew your regular DL or ID cards, which are not compliant with the Federal “REAL ID Act of 2005.” The non-compliant cards will be marked, “Not for Federal Identification,” (see photo below).